SCVHistory.com | Obituaries | The Untimely Deaths of Emma & J.H. Tolfree, 1896-97. The Untimely Deaths of Emma & J.H. Tolfree. Owner of Eating Houses at SPRR Saugus, Bakersfield and Mojave depots. In A Moment of Madness. Grover Cleveland's Ex-Secretary Swallowed Carbolic Acid. San Francisco Chronicle | July 21, 1896. Mojave, July 20. — A Coroner's jury returned a verdict in the case of Mrs. J.H. 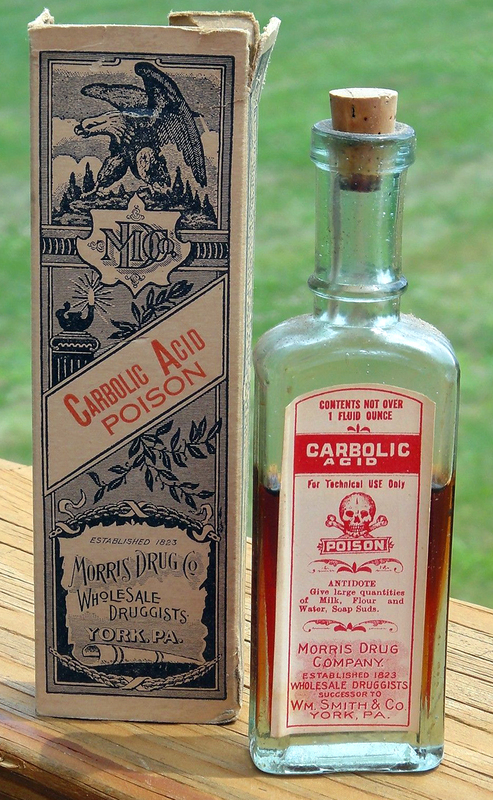 Tolfree that death was caused by a dose of carbolic acid, self-administered while temporarily insane. No cause can be assigned other than this. She left nothing for explanation but an unfinished letter, not dated, to her mother, but it si the opinion that she wrote to her relatives last Saturday. The funeral will be held Tuesday at 2 o'clock at Los Angeles. Her maiden name was McMunn, and she was born in Coshocton, O., in 1868. Mrs. Tolfree was very handsome, of sweet disposition and pleasant to every one. She was well known all over the United States, especially in Washington, D.C. Mrs. Tolfree was secretary to Grover Cleveland while he was Mayor of Buffalo. Webmaster note: Grover Cleveland (1837-1908) was the 22nd and 24th president of the United States, serving in that office from 1885-1889 and 1893-1897, so he was president when Mrs. Tolfree met her demise. Cleveland served as mayor of Buffalo from Jan. 2 to Nov. 20, 1882, at which time he was elected governor of New York. A Hotel Man's Sudden End. J.H. Tolfree Passes Away in the South. Proprietor of Railroad Eating-Houses in the San Joaquin Valley. San Francisco Chronicle | January 17, 1897 | Special Dispatch to the "Chronicle." Los Angeles, January 16. — J.H. 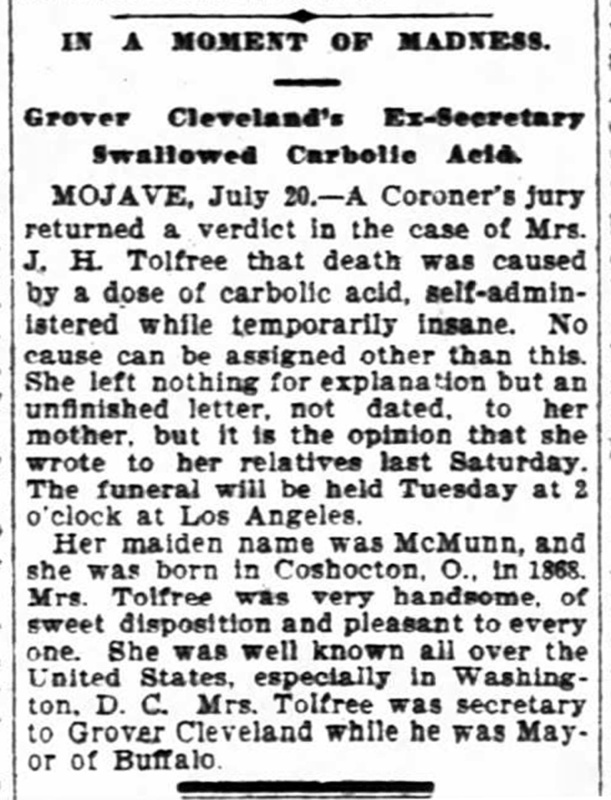 Tolfree, formerly proprietor of the Nadeau Hotel of this city and proprietor of the eating-houses on the San Joaquin division of the Southern Pacific, was found dead in bed at Mojave early this morning in the same room where, a few months ago, his beautiful young wife committed suicide by swallowing carbolic acid. When the news of his death reached this city it was at once rumored that Tolfree had taken his life, but later information proves this to be an error. Tolfree returned to Mojave last Thursday from a business trip to this city. He retired last night about 10 o'clock as usual, and when the clerk went to call him this morning he failed to get a response. Finally an entrance was forced and he was found dead in bed. Dr. Dempsey was immediately summoned, and after making an examination gave his opinion that death was due to apoplexy. There was no indication of suicide and as Tolfree was a very corpulent man and a high liver, it is believed that death was due to natural causes. The Coroner will hold an inquest to-morrow and the body will probably be brought here for interment. Tolfree was very jovial and had a large circle of friends all through the State. Last winter he leased the Nadeau Hotel, but gave it up this spring and devoted his time to the management of his eating-houses, which he had charge of for three years [sic; see envelope postmarked 1890]. He made plenty of money and was doing well until last July, when his wife committed suicide. The blow was a hard one, and Tolfree had been inclined to melancholy ever since, and in his conversation with friends has referred to the tragic death of his wife. Last Thursday he told Chief Clerk Jenkins of the Nadeau that he was doing well financially, but was not contented. He expressed the intention of getting away from business cares as soon as possible. This probably gave rise to the suicide theory. Tolfree was 50 [sic] years old and had two children by a former wife, Miss Maude, now in Mojave, and a son in New York city. Grief Over the Suicide of His Wife Leads J.H. Tolfree to End His Existence. San Francisco Call | Sunday, January 17, 1897. Los Angeles, Cal., Jan. 16 — One of the saddest and most tragic cases of suicide ever known in this part of the State was reported in a special dispatch to Manager Chase of the Nadeau Hotel of this city from Mojave Junction this forenoon. It involves the death of J.H. Tolfree, formerly connected with the management of the Nadeau, and a gentleman well and favorably known throughout Southern California, and especially along the lines of the Southern Pacific Company, where he owned and conducted several hotels and lunch-counters. Carbolic acid, aka phenol (C6H5OH) is mostly used in the manufacture of plastics today. In Tolfree's time it was used medicinally to clean wounds and sterlize surgical instruments. One of its big proponents was the British surgeon Sir Joseph Lister. At first (starting 1879), phenol was an active ingredient in Listerine mouthwash (2.5 percent solution). While but meager particulars of the demise of Mr. Tolfree have been forwarded it is known that he has been inconsolably depressed ever since the death by suicide of his wife a few months ago. From what is known it is understood that she destroyed herself by means of carbolic acid in the same room where he was found dead this forenoon. To all appearances he employed the very same means used by his late wife. It was known among Tolfree's most intimate friends that a deep melancholia had taken possession of his mind, and while no one anticipated suicide as a result of his bereavement, much of what he has from time to time said to them, in more or less serious strain, is now fully understood. Last Thursday he visited this city, and in conversation with Clerk[?] Jenkins of the Nadeau said that he was doing well financially, but was far from being contented, and expressed the intention of getting out of business cares as soon as possible. This was construed at the time to mean that he expected to dispose of some of his business interests and take life easy. Tolfree was an affable, genial gentleman and had many warm personal friends in all parts of California. The authorities of Kern County will take charge of his body. Found Dead in His Bed from an Apoplectic Fit. Los Angeles Times | January 17, 1897 | By Associated Press Wire. Mojave, Jan. 16. — J.H. 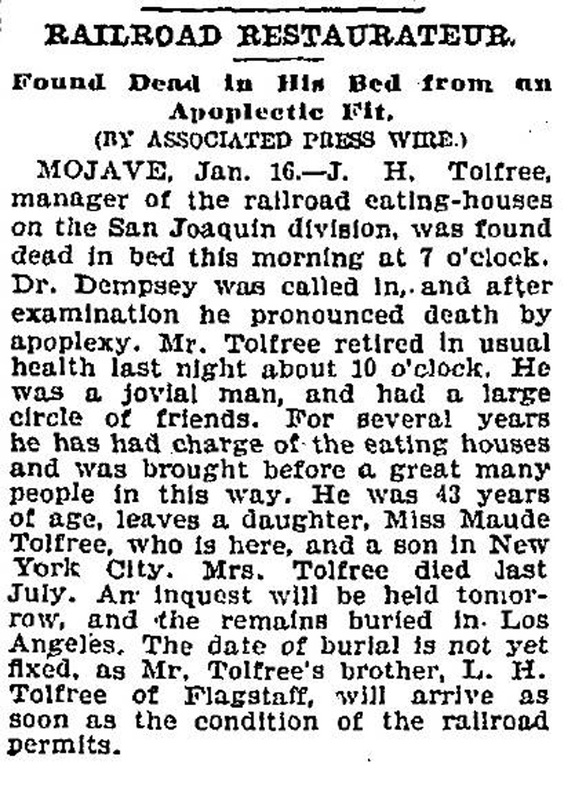 Tolfree, manager of the railroad eating-houses on the San Joaquin division, was found dead in bed this morning at 7 o'clock. Dr. Dempsey was called in, and after examination he pronounced death by apoplexy. Mr. Tolfree retired in usual health last night about 10 o'clock. He was a jovial man, and had a large circle of friends. For several years he has had charge of the eating houses and was brought before a great many people in this way. He was 43 [sic] years of age, leaves a daughter, Miss Maude Tolfree, who is here, and a son in New York City. Mrs. Tolfree died last July. An inquest will be held tomorrow, and the remains buried in Los Angeles. 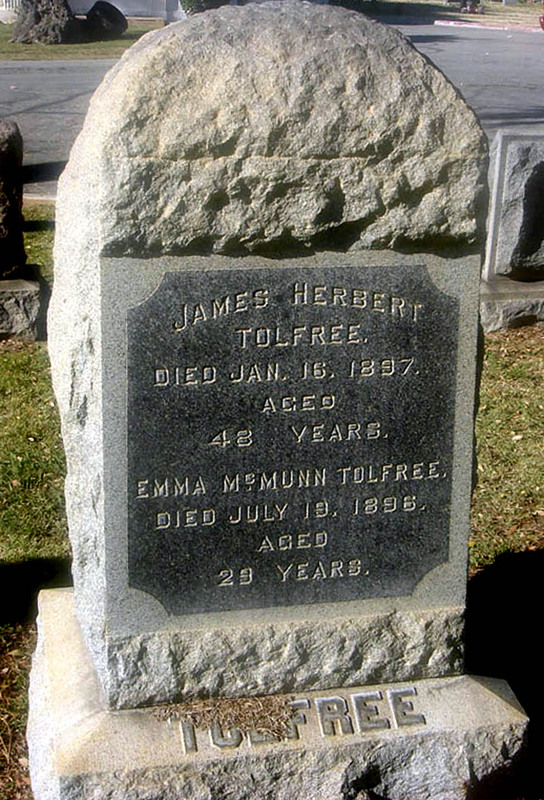 The date of burial is not yet fixed, as Mr. Tolfree's brother, L.H. Tolfree of Flagstaff, will arrive as soon as the condition of the railroad permit. Sacramento Record-Union | January 17, 1897. Los Angeles, Jan. 16. — J.H. 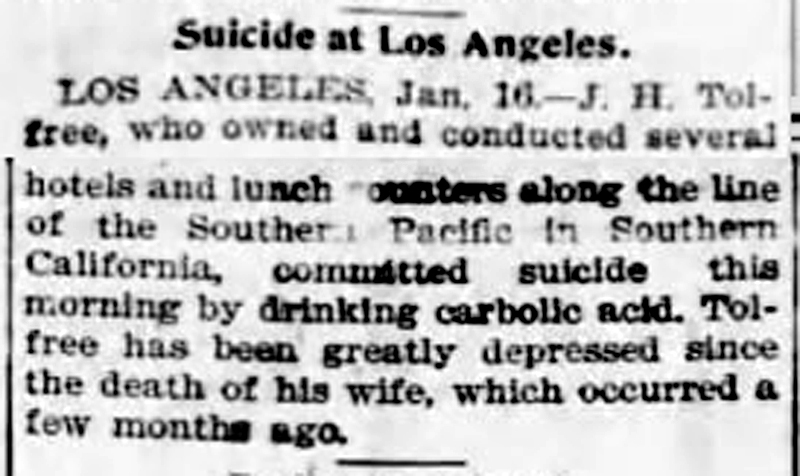 Tolfree, who owned and conducted several hotels and lunch counters along the line of the Southern Pacific in Southern California, committed suicide this morning by drinking carbolic acid. Tolfree has been greatly depressed since the death of his wife, which occurred a few months ago. Inquest and Funeral of J.H. Tolfree. Los Angeles Times | January 19, 1897. The Coroner's inquest held on the body of J.H. 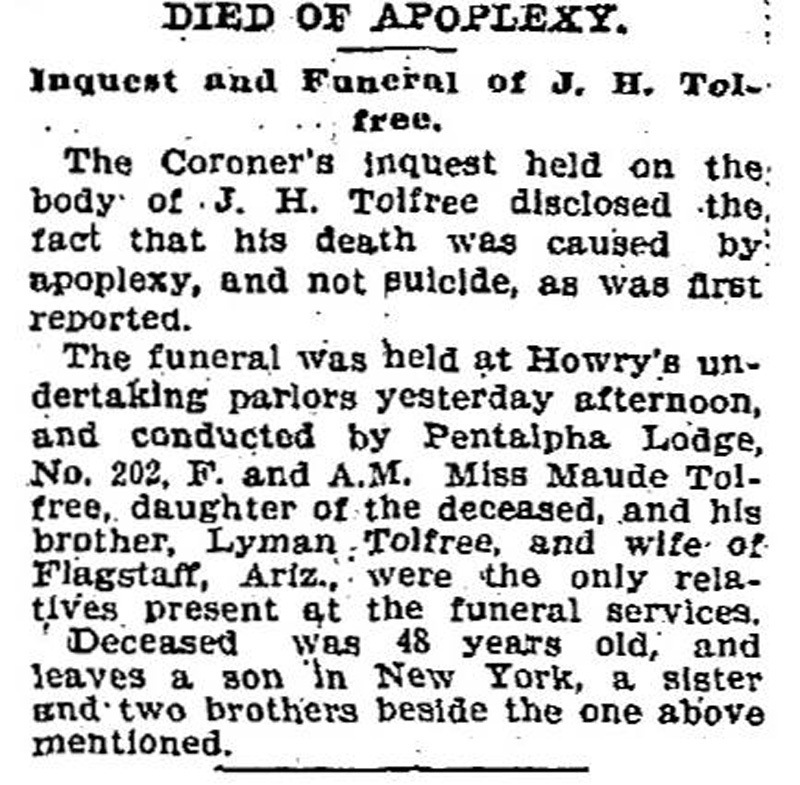 Tolfree disclosed the fact that his death was caused by apoplexy, and not suicide, as was first reported. The funeral was held at Howry's undertaking parlors yesterday afternoon, and conducted by Pentalpha Lodge, No. 202, F. and A.M. Miss Maude Tolfree, daughter of the deceased, and his brother, Lyman Tolfree, and wife of Flagstaff, Ariz., were the only relatives present at the funeral services. Deceased was 48 years old, and leaves a son in New York, a sister and two brothers beside the one above mentioned. The J.H. Tolfree who is referenced in these news stories is James Herbert Tolfree, who founded "eating houses" inside the Southern Pacific Railroad depots at Bakersfield, Mojave and Saugus in the late 1880s. Concurrently, for a brief period in 1896-97, he was also involved in the management of the Nadeau Hotel, the first four-story building in Los Angeles. (The hotel started construction in 1882, its owner Remi Nadeau having grown rich off of the freighting business from the Cerro Gordo silver mines.) After Tolfree's death, Tolfree's Saugus Eating House in the depot would move across the street and become the Saugus Cafe. Born in 1849, Tolfree died at age 48 on Jan. 16, 1897, as noted here. He shares a headstone at Angelus Rosedale Cemetery (1831 W. Washington Blvd., Los Angeles) with his wife, Emma McMunn Tolfree, who was born in 1868 and preceded her husband in death by six months on July 19, 1896. She was 29.